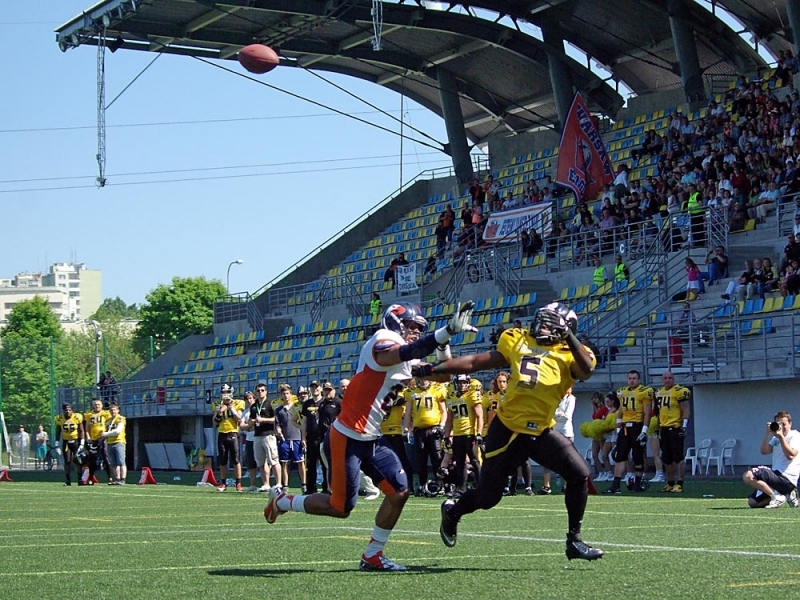 The race for first in the Topliga North Division tightened in dramatic fashion on Sunday afternoon, after the visiting Warsaw Eagles stole a victory from the Gdynia Seahawks on the final play of the game to put the two teams to within a half-game of each other in the standings. Shane Gimzo's 3-yard touchdown run with no time remaining on the clock capped a comeback that began with Warsaw trailing by 13 points late in the third quarter. The 6-2 Eagles officially clinched a playoff spot with the victory, eliminating Kozły Poznań from the playoff hunt with their third straight win. They were also able to break a three-game losing streak against the Seahawks, who nonetheless maintain the lead in the division with a record of 7-2. Gdynia still holds the tiebreaker advantage over Warsaw as well, meaning that the Seahawks control their own destiny in the race between the two teams. The fact that the Eagles will now need the Seahawks to lose to Kozły in Gdynia's final game of the season to give them a chance of capturing the division title will be of little worry at this point to Warsaw fans, who have seen their heroes struggle against the Topliga's better teams this season. Even if Poznań manages to upset the defending champions next weekend, the Eagles will still need to win their final two games, including one against the 7-1 Wrocław Devils, to leapfrog the Seahawks in the standings. Things seemed to have started well for the hosts at the National Rugby Stadium, as the Seahawks blocked an Eagles field goal attempt in the first quarter on the only drive by either team that threatened to put points on the board. However, the advantage gained from that play was quickly undone when Łukasz Koniusz picked off a Ferni Garza pass and took it 57 yards for a touchdown that gave Warsaw a 7-0 lead at the end of the first quarter. The Seahawks came on strong in the second quarter, however, as Garza rebounded to throw two touchdown passes to put Gdynia on top at the break. Jeremy Dixon capped off a 94-yard drive with his league-leading 12thtouchdown reception, tying the game in the process, and Marcin Bluma caught a 29-yard touchdown pass to give the Seahawks the lead after an Eagles turnover had given Gdynia the football near midfield. Gdynia extended the lead in the third quarter, after a 70-yard reception by Bluma left them in a goal-to-go situation. Sebastian Krzysztofek, now apparently back at full strength for the Seahawks, cashed in with a 6-yard touchdown run, and the Seahawks led by the same score, 20-7, that showed on the board at the end of the meeting between the two teams earlier this season in Warsaw. That lasted for all of about two minutes, however, as Clarence Anderson took the kickoff back 88 yards for a touchdown to get the Eagles to within 7 points. Coach Phillip Dillon decided to take a risk, and Warsaw went for a fake on the conversion attempt. The gamble paid off when Filip Mościcki found Caleb Singleton in the end zone to convert the two-point try, and suddenly it was 20-15. The teams traded long drives in the fourth quarter, with each being stopped on downs once inside the other's red zone. The Eagles took possession for their final drive with just 90 seconds remaining, and needing to go almost the entire length of the field to win. They drove quickly and effectively down the field, reaching the 3-yard on fourth down with just two seconds showing on the clock. Gimzo took the snap and called his own number on the option play. He reached the goal line easily after turning the corner, and the Eagles sideline erupted in euphoria. As noted above, the Seahawks can clinch the top seed in the division if they beat Kozły next weekend. The two teams will hook up in Poznań on June 16. The Eagles will be in action next a day earlier, when they visit the Warsaw Spartans. Their season-ending matchup against the Devils will take place on June 22.